Years ago, I worked for a high-end furniture maker whose tables were beautiful. Thanks to repeated sandings and buffings, their feel was extraordinary: like polished granite but soft and warm. When it comes to furniture, he explained, people – especially women – prioritize touch. “When women visit a showroom and touch these tables, they want them,” he said. Scientists are just now beginning to contemplate our sense of touch and pursue questions answered long ago about our other senses. Our skin is “a sensing, guessing, logic-seeking organ of perception, a blanket with a brain in every micro-inch,” wrote Adam Gopnik, the author of an outstanding article on the science of touch. Read here. The eye splice on this Knotty Girlz lead line is simple and elegant. It should be no surprise, then, that of all the positive attributes of the Knotty Girlz rope halters, I gravitated most to how they felt in my hands and how I believe they’d feel on my horses’ faces. A 2-knot halter made of 5/16 inch diameter polyester rope with a half-inch diameter, 12-foot lead. The set was a lovely, neutral beige and white. A 2-knot halter made of ¼ inch diameter polyester with a 9/16 inch diameter, 14-foot lead. 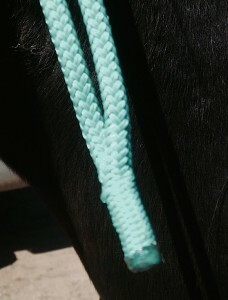 This set was a turquoise halter with a brilliant multi-colored lead line. Both lines had leather poppers. The halters and lines are tough and without stretch, yet soft and pliant. 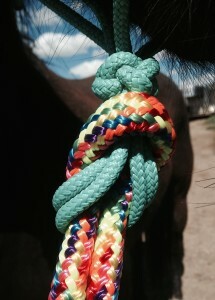 Those are rare combinations and attributes I have yet to see from any other rope halter manufacturer. 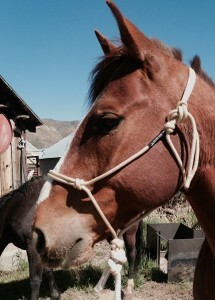 The end for tying the halter does NOT have a metal tip. This is a fine, yet significant point taken up by many professionals who don’t want their clients accidentally whipping the tip in a horse’s eye. A metal tip can cause damage; a rope tip likely will not. Instead, the two lines coming over the horse’s head are spliced together and then melted. Pretty nifty. I absolutely love the “eye-splice” of one of my lead lines. Eye-splicing means there is no knot to contemplate or struggle with. The eye splice is the most popular option of Knotty Girlz customers, said business manager Christine Kovacevich. The weight and thickness of the rainbow lead line was more than I’m used to, but that isn’t necessarily a bad thing. It would be nice for working with a young horse. And a friend pointed out that it would work well for a pack horse, when laying the rope across the pommel and ponying hands-free is possible with a nice heavy rope. Thanks to Tom Weaver and his horses, Rocky and Rivers. Weaver’s handsome geldings modeled the Knotty Girlz gear. Enter “Cayuse” when ordering and receive 10 percent discount. Coming next week: Considering the Knotty Girlz 4-knot and 2-knot rope halter options. A review by horsewoman Amy Skinner. Posted in gear, Reviews and Links and tagged knotty girlz, rope halter review. Good points on the clip and possible injury to the eyes. 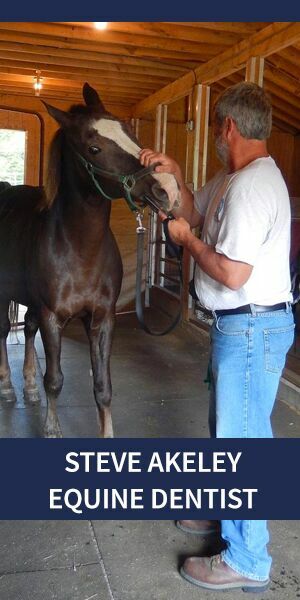 I prefer using a rope halter and will definitely change the lead. Looking forward to the next article.